Offensive performance by position (and the closely related topic of positional adjustments) has always interested me, and so each year I like to examine the most recent season's totals. I believe that offensive positional averages can be an important tool for approximating the defensive value of each position, but they certainly are not a magic bullet and need to include more than one year of data if they are to be utilized in that capacity. The 2011 results were most notable for the poor performance by third basemen and the pathetic effort by left fielders, who were slightly less productive than the average non-pitcher. After a down 2010, DHs rebounded to a respectable 110. The other positions were fairly close to their historical norms, and pitchers avoided setting a new all-time low, although the difference between 7 and 5 is negligible. Milwaukee ranked second and Arizona first last year, but on the other hand the Mets were third in 2010 and dead last in 2011. AL pitchers don’t get enough opportunities to bother with a chart, but for trivia’s sake, Baltimore’s pitchers raked .405/.405/.630, while Kansas City’s failed to reach base in eighteen plate appearances. The only one of these that was a bit surprising to me even after looking at the final stats for individuals was the Cubs’ third basemen (led of course by Aramis Ramirez). But a lot of the usual suspects at third base had injuries and other issues this year (Longoria, Zimmerman, Wright, Youkilis). 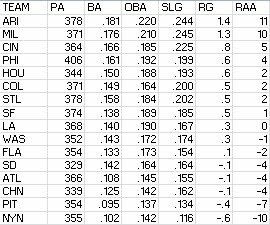 It’s mostly a coincidence that all of the worst-hitting positions were from AL teams, although they do generally get more PA in which to drive down their RAA. I wrote about the Twins and Angels catchers a little in the previous post, but note here that Houston’s catchers were second last with -31 RAA and the Angels managed -29. The continuing inability of Seattle to generate offense is a marvel, and Juan Pierre is an appropriate banner carrier for 2011’s crop of poor hitting left fielders. Third base and shortstop led the Mets to the highest infield RAA in the NL. Atlanta tied for the lowest outfield RAA in the NL. 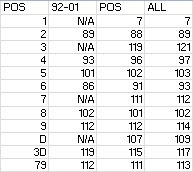 There must be something wrong with my spreadsheet as surely the Phillies first basemen combined for more than 8 RAA, led by their perennial MVP candidate. St. Louis was the only team in the game to be above average at every position, and really stood at out at the three biggest offensive positions. Their outfield combined to lead MLB in RAA. Milwaukee’s offense was structured similarly, although right field did not stand out and they gave a lot of it back with a black hole at third base. The Cubs’ outfield production was evenly distributed and combined to tie Atlanta for the lowest mark in the NL. Pittsburgh’s infield tied for the NL’s trailer spot. Houston got decent production in the outfield but nowhere else. The fact that the Los Angeles infield tied for the fewest RAA in the NL and yet the offense combined to lead the division should give you a quick idea on the offensive character of the NL West. While the World Series title makes it easy for some to overlook, San Francisco’s offensive struggles are persistent and pitching can only take you so far. Boston’s offense was terrific despite right field, leading the majors in infield RAA. Toronto pulled a neat trick by combining for -17 RAA from the outfield despite having Jose Bautista. Kansas City led the AL in outfield RAA, which not many would have predicted from Alex Gordon, Melky Cabrera, and Jeff Francoeur. Cleveland’s outfield was second-worst in the majors, and under normal circumstances -62 from the outfield would stick out more. The best thing that can be said about Chicago’s -98 RAA is that it was balanced -49/-49 between infield and outfield, with catcher and DH nearly average (+2/-2). Texas kept the AL West from looking like it’s NL counterparts. Chris Iannetta and some guy whose name I can’t remember should do wonders for LAA. Oakland’s -50 runs from the infield was the worst in the majors, almost all driven by dreadful production at first base. And then there’s Seattle. What can one say about Seattle? 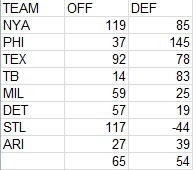 Every outfield position was at least -20 (only five other outfield spots across the other 29 teams were at -20). Catcher, third base, and DH also stood out for the hapless Mariners. Earlier I displayed some long-term positional adjustments that I’ve used over the years. It dawned on me in September that those were based on the ten-year period from 1992-2001, and that at this point, none of the most recent ten years are included in the sample. So I figured it would be an opportune time to recalibrate my position adjustments, using the ten years from 2002-2011 as the basis. The big movers relative to 1992-2001 were the middle infield positions, improving offensively as first base/DH declined a little. In the end, though, the defensive spectrum one would draw based on offense doesn’t change at all, except for third base switching places with center field (and the differences were miniscule in both decades) to match Bill James’ spectrum. A longer digression about the application of position adjustments, and some reasons why one might want to consider using offensive adjustments, will have to wait for another time, but would be appropriate here. 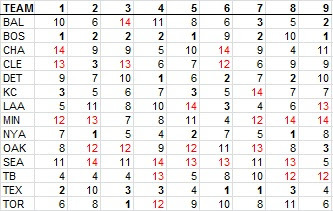 This spreadsheet includes the 2011 data by position. The data in this post was taken from Baseball-Reference. The figures for each team's runs are not park-adjusted--I intended to do so, but unfortunately I had already written the body of the post before I realized that they’d been omitted. The Padres having the worst 2, 3, and 4 production in the NL should have alerted me to this sooner. Then I had to go back and remove some comments that make no sense when ignoring park effects, so now the post is just a skeleton. Oh well. RC is ERP, including SB and CS, as used in my end of season stat posts. The weights used are constant across lineup positions; there was no attempt to apply specific weights to each position, although they are out there and would certainly make this a little bit more interesting. This marks a third straight season that the most productive lineup slot in the majors was the NL’s #3 hitters…Pujols, Votto, Braun and company. Despite all of the seemingly silly things managers do with their batting orders, it is comforting to know that, from the cleanup spot down, each subsequent spot is less productive. 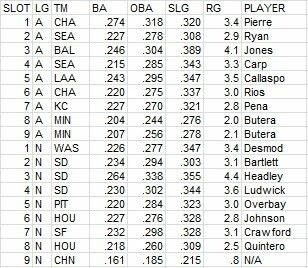 Of course, that doesn’t excuse the feeble performance of NL #2 hitters, who just edged out the #8 hitters as the least productive NL spot filled by real hitters. Mathis was intentionally walked twice; both came in a June 17 game at the Mets. No word on whether or not Ron Washington temporarily replaced Terry Collins. Note that Houston’s #9 hitters (the best in the NL at 2.3 RG) almost managed to outhit their #8 hitters (worst in the NL at 2.5 RG). 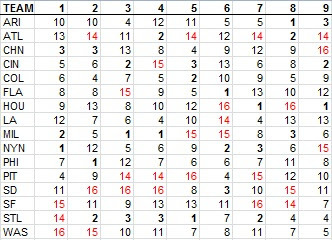 Finally, this table has each team’s RG rank among the lineup slots in their league. The top and bottom three in each league have been noted, which make Boston and Seattle stand out (for opposite reasons, of course). Here is a link to a Google spreadsheet with the underlying data. The RG and RAA figures in this one are park-adjusted as should have been done throughout this post. Listed in parentheses after a team are all players that appeared in twenty or more games in the leadoff slot--while you may see a listing like "BOS (Ellsbury)” this does not mean that the statistic is only based solely on Ellsbury's performance; it is the total of all Boston batters in the #1 spot, of which Ellsbury was the only one to appear in that spot in twenty or more games. I will list the top and bottom three teams in each category (plus the top/bottom team from each league if they don't make the ML top/bottom three); complete data is available in a spreadsheet linked at the end of the article. There are also no park factors applied anywhere in this article. Obviously you all know the biases inherent in looking at actual runs scored. It is odd to see St. Louis near the bottom as they had a good offense overall. Usually the leadoff hitters will manage to score some runs when they have Pujols, Holliday and Berkman coming up behind them whether they get on base that much or not. I would not have correctly identified the Cubs as having the highest OBA out of the leadoff spot in my first fifteen guesses, I don’t think. The seven point difference between the overall major league OBA and the OBA of leadoff men is a little smaller than it usually is, but last year the gap was just two points. The next statistic is what I call Runners On Base Average. The genesis of it is from the A factor of Base Runs. It measures the number of times a batter reaches base per PA--excluding homers, since a batter that hits a home run never actually runs the bases. It also subtracts caught stealing here because the BsR version I often use does as well, but BsR versions based on initial baserunners rather than final baserunners do not. You are probably starting to notice a lot of repetition in the leaders and trailers. Obviously a lot of these metrics measure the same thing in slightly different ways or measure similar things, so it’s to be expected. In this presentation, the rank difference between ROBA and LOBA is barely noticeable. The presence of the Red Sox in the bottom three on this list should drive home the point about this not being a quality metric. 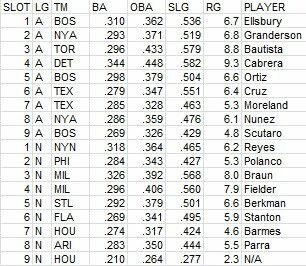 The leadoff hitters that rank the lowest in R/BI are those that drive in almost as many runs as they score. If you had a leadoff hitter that was driving in many more runs than he scored, that might be cause for some reconsideration of your batting order, but having some scored/batted in parity is not inherently a bad thing. Last year, the White Sox led handily in RER, due in large part to Pierre’s steals. This year, Pierre didn’t steal as many bases but still managed to slap his team to the top. The Indians have been just missed the trailer spots on a number of these lists. At least Cleveland and St. Louis are at the bottom largely because their leadoff hitters didn’t attempt that many steals. Only Milwaukee and Baltimore leadoff hitters (16 and 21 respectively) attempted fewer steals than Cleveland (24) and St. Louis (18). Neither the Tribe (58%) nor the Redbirds (56%) had success when they did steal, but they weren’t trying it all that much. The White Sox, on the other hand, were 31-48 (65%), a poor percentage and the eleventh-most attempts. From an overview of all of these metrics, I think it’s safe to say that Red Sox and Mets leadoff hitters were pretty effective while White Sox, Nationals and Giants were not. I was a little disappointed that the Braves and Astros didn’t make any lists together here as each team used both Michael Bourn and Jordan Schafer in twenty or more games out of the #1 spot. Obviously that’s a possibility when players are traded for each other, but it would have been particularly amusing had one team been on the leader list and the other on the trailer list. A spreadsheet with all of the data and the full lists is available. I have to apologize in advance for this--it sort of resembles a bad Jayson Stark piece with better metrics but less interesting tidbits. * The discrepancy in R/G between the AL and NL (for the offenses) expanded to .33 (4.46 to 4.13) after a one-year blip that saw the two circuits only .12 runs apart. The leagues were equal in walk rate (.090 and .091 per at bat), but the AL hit for a higher BA (.258 to .253) and with more power (.150 to .139 ISO). * I certainly do not intend to dispute the notion that Houston was the worst team in baseball, but Minnesota actually had a lower EW% and PW%. Based on runs and runs allowed, Houston “should have” won 61.8 games to Minnesota’s 61.5, and runs created expected a wider gap, 63.3 to 59.8. Obviously this does not consider strength of schedule, but it does put into perspective just how disastrous the Twins’ season was. * Tampa Bay led the majors in converting balls in plays into outs by a wide margin; their DER of .712 was as far ahead of second place LAA as the Angeles were ahead of twentieth place STL. The Rays also led the majors in modified fielding average, albeit not by a runaway margin. As a brief aside, “modified” fielding average is no more complex or accurate than regular old fielding average, except I remove strikeouts and assists from the formula. It would actually be easier to work with if I looked at the complement (errors/(putouts less strikeouts + errors)), but fielding average has been expressed that way for ever and it’s not a particularly telling metric in any event. * In 2010, major league teams had an unusually high W% at home (.559) and 28 teams had a higher W% at home than on the road. This led to some speculation about whether there was something afoot. 2011 did not provide any such conspiracy fodder. Home teams had an abnormally low W% (.526), and only 23/30 teams (77%) won with a greater frequency at home. It was the lowest HW% for MLB since 2001 (.524), and 2005 was the last time that only 23 teams were better at home (only 20 were in 2001). * The Giants scored 2.91 runs per game at home, the lowest output since 1972. They had to do the near impossible to achieve this by scoring less than the legendary 2010 Mariners (2.95). Offensive ineptitude combined with their good defense resulted in San Francisco playing in the lowest overall scoring context (7.09 RPG) in the majors since the 2003 Dodgers (6.98). * Don’t tell anyone, but the two teams that struck out the fewest times were the Rangers (930) and the Cardinals (978). Both did unsurprisingly ground into a lot of double plays--Texas was sixth in MLB with 135 and St. Louis’ 169 was sixteen more than second place Baltimore. As you can see, the average playoff team was fairly balanced. The only subpar unit in the group was the defense of the World Champion St. Louis Cardinals. Their 4.26 relief eRA was equal to the American League average. But the interesting thing is that all of them were rookies except for Joakim Soria. I’ve already said nice things about Greg Holland in my Rookie of the Year post, so I won’t repeat that here. * Someone beat me to it, but it is worth pointing out how low Trever Miller’s innings to appearance ratio was, particularly during his time in St. Louis. Miller recorded 47 outs in 39 appearances (1.21 O/G) with the Cards. I cannot state this absolutely, but I believe that is the lowest ratio in ML history for a pitcher with 20 or more appearances. The previous low I can find is Randy Flores with the 2009 Rockies (36 outs/27 games, 1.33). Miller’s complete season line was a yeoman 64 outs in 48 games, tying Flores’ record. A fitting achievement for Tony LaRussa’s final season if I may say so myself. * One of the stats I track for relievers is inherited runners/game. 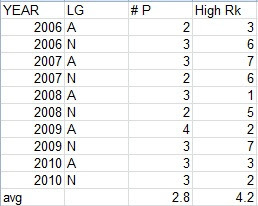 In an era where leverage index is readily available, it doesn’t yield much marginal value, but I always like looking at closer usage through IR/G. Closers usually dominate the bottom of the IR/G list (I believe Mariano Rivera led full-time AL closers at .31, which was 71st out of 85 relievers), but it’s always fun to see which closers were never brought in with runners on base. If a manager never calls on his closer with runners on, he’s either really locked into bullpen roles, or he really doesn’t trust him. I’d assume the latter was the case with Kevin Gregg, who inherited zero runners in 2011. The former was the case for John Axford (1 in 74 appearances). * Brian Wilson has taught us that a quirky personality, a ridiculous beard, and a World Series ring can get you a lot of commercials with 7 RAR. Who was the last closer so marginal that got so much publicity? * Which Yankee reliever is which? The point here is not to compare the two, but to point out that David Robertson had a really great season. * You wouldn’t know it from watching the playoffs (and Ron Washington and the Rangers reluctance to use him that eventually turned into an outright dropping off of the roster), but Koji Uehara ranked fifth in RAR among AL relievers and was seventeenth last year. Of course, if all you went by was Washington’s managing, you would be shocked to learn where Nick Punto tends to rank on RAR lists. * Five major league starters averaged 110 or more pitches per start this year, which has to be the most in some time. I’m pretty sure that hasn’t happened since I’ve been including P/S in my year end stat reports, although I didn’t go back and check to make sure. The five were: Verlander (117), Weaver (113), Halladay (111), Shields (111) and Sabathia (110). * At the risk of cherry picking (as I’m sure I’m leaving out some pitchers that were talked about similarly but have had continued success, plus one season is obviously insufficient to draw conclusions in any event), I always find it a little satisfying when pitchers that were said to be DIPS beaters have either terrible or high BABIP seasons. Trevor Cahill is in the latter category--he wasn’t horrible by any means, and a .306 BABIP is not that high, but it still is not the kind of season a good DIPS beater should have. JA Happ, on the other hand, was atrocious and gave up an identical .306 BABIP. Even Charlie Morton sort of fits--even looking at his entire season, he wound up at -3 RAA with a .323 BABIP. Along those lines, what are the odds that Josh Tomlin is in the major leagues in five years? They can’t be that good. * JoJo Reyes seemed to get a lot of attention for his lengthy (by time, especially) losing streak early in the year. Or perhaps my impression of that is off, magnified by the fact that I watched him get his first win pitching against Cleveland. In any event, Reyes may have had some bad luck along the way, but a lot of it evened out in 2011. A pitcher with a 6.45 RRA, 6.24 eRA and 5.21 dRA should consider himself darn lucky to wind up 7-11. * PSA: David Freese is 28 and ranked 6th in RG among NL third basemen. I overlooked it, but Chase Headley actually had a .393 OBA and created 6.1 runs per game, second to Pablo Sandoval among NL third baseman. So postseaon hardware aside, Padres fans shouldn’t feel too terribly about which of their possible third basemen they actually have. * AL players with negative RAR who at one time were actually good included Vernon Wells, Magglio Ordonez, JD Drew, Justin Morenau, Alex Rios, Chone Figgins and Adam Dunn. Morneau went from first among AL first baseman in RG in his concussion-shortened 2010 to last in 2011. * AL players who had an OBA greater than their SLG were: Ryan Sweeney, Chris Getz, JD Drew and Adam Dunn. But for as bad as Dunn’s season was, Chone Figgins’ was actually worse on a rate basis. Figgins only played in 81 games to Dunn’s 122, but still held just a -15 to -17 RAR lead. Figgins created 1.75 runs per game, lowest among all major league players with 300 PA, lower even than Paul Janish (1.90). * Which of these teammates would you assume was more valuable, based on the statistics presented here? Of course, any opinion you’d form would be woefully incomplete, because I’ve only given you offensive statistics, without telling you anything about position or defense. Offensively, though, they are nearly indistinguishable. So what if I tell you that one of these players is a slow first baseman and the other one is a center fielder? Surely, the center fielder must have been more valuable, right? How about these two teammates? They both play the same position, but one of them was signed as a free agent and took the other’s spot at their common position (third base)--so the one who was pushed off played 105 games at 1B/DH and 55 games at the other infield positions. The one who got the fielding job was more likely the more valuable player, right? One would think. But the first baseman finished 10th in the MVP voting and the center fielder finished 13th. The third baseman finished fifteenth while the 1B/DH finished 8th and got a first place vote. My position on pitchers as MVP candidates is pretty simple: I think they absolutely should be considered. However, that doesn’t mean it’s a common occurrence for me to conclude that a pitcher was the MVP of his league. In general, I think that given modern workloads, it is much more likely for a batter to be the MVP than a pitcher. Additionally, when I conclude that a pitcher and a position player are indistinguishable in terms of value, I will usually hedge my bets and go with the batter. A corollary to this is that I’d like the pitcher’s peripheral statistics to indicate that he is equally or more valuable than his batting rivals, not just his actual runs allowed. This is a higher hurdle to clear, since the best pitchers in terms of runs allowed are more likely than not to have outpitched their peripherals. As you can see, on average I list three pitchers on my ballot, with the leading pitcher placed fourth. Obviously I’m biased, but I think this is a very fair treatment of pitchers. All of this bloviating and laughably in-depth analysis of my own previous ballots is necessary because, for the first time since I’ve been doing this, there is a popular movement to vote a starting pitcher as MVP. I want to make it clear that, and I think I have, that if I don’t feel that Justin Verlander was the AL MVP, it’s not because of some bias against pitchers, but simply that I felt other player(s) were more valuable in 2011. Verlander has gained traction as a candidate for two reasons. One, he pitched for a playoff team, and heavens knows that mainstream types will bend over backwards to try to give the MVP to a player whose contributions were “actually valuable”, or whatever argument they’d like to use to dismiss players whose teammates just weren’t that good. It also helps that of the AL playoff teams, Detroit was something of a surprise (they were certainly the most surprising to me, although the voters would probably give that nod to Tampa Bay), and they made a strong surge in August and September to run away with their division. That’s a good narrative. Secondly, Verlander’s W-L record is very impressive (24-5), and we all know that the mainstream still is easily distracted by a shiny W-L record. And oh yeah, third, he pitched very well by any measure. Verlander’s 84 is very good, but the average of the previous four AL leaders was 82. It’s a fairly typical league-leading type of performance, a very solid Cy Young-type season, but not one for the ages either. However, I have Jose Bautista at 82 RAR/63 RAA, I don’t see any compelling reason to penalize him for his defense or baserunning (UZR doesn’t think much of him, but Dewan’s DRS and Wyers’ FRAA don’t share that evaluation), and I don’t care that his team finished in fourth place. Verlander does not look nearly as good when evaluated by dRA, and so when there’s reasonable doubt that the pitcher was more valuable than the position player, I side with the position player. I also have placed Verlander’s teammate Miguel Cabrera ahead of him, albeit with much less conviction. Cabrera’s offensive value is essentially indistinguishable from Bautista’s--I estimate that Cabrera created 137 runs in 376 outs while Bautista created 134 runs in 363 outs (9.3 to 9.4 RG, 71 to 70 HRAA). However, Cabrera played first base and there’s reason to believe he’s a below-average fielder, putting Bautista ahead. Compared to Verlander, though, I think the case can be made that he was a little more valuable. Among the other position player candidates to fill out the ballots, Jacoby Ellsbury ranks first in RAR, plus fielding and baserunning would seem to work in his favor. Adrian Gonzalez was right behind his teammate in RAR, and has a good fielding reputation and a decent showing in fielding metrics. The other three spots all go to second baseman. I suppose one can argue that the positional adjustments I use are too kind to second basemen, but I just happen to think there is a collection of very talented second basemen in the AL at this time. Dustin Pedroia was just behind Ellsbury and Gonzalez in RAR. Curtis Granderson (56 RAR) and Mike Napoli (56) rank ahead of the trio of Robinson Cano (53), Ben Zobrist (52), and Ian Kinsler (50), but Granderson’s fielding raises at least a little concern. Napoli’s RAR gives him a full catcher position adjustment, but he actually played nearly as many games between first base and DH (53) as he did as a catcher (61). While his 8.5 RG ranked third in the AL behind Bautista and Cabrera, he also logged just 427 PA. In the National League, there is no need for philosophical reflection about the value of a pitcher versus a position player, or any need for intricate comparisons of multiple players. There is only one question that needs to be answered: Can you make a case against Matt Kemp? Kemp led NL hitters in RAR by 12, and was in a tied Ryan Bruan for the league lead with a 8.5 RG. His fielding is probably not great, but since no one else was particular close in RAR, you’d have to think he was pretty bad and that Ryan Braun or Prince Fielder or Jose Reyes was really good in the field to close the gap. I don’t see any reason to believe that, so Kemp is my runaway choice as NL MVP. Filling out the rest of the ballot, Ryan Braun is a very strong candidate for #2. The three pitchers (Halladay, Kershaw, and Lee) that were very close for the Cy Young are all strong mid-ballot choices. Prince Fielder was very good, but inferior to his teammate at the plate and he’s not a strong candidate for fielding and baserunning credit. Jose Reyes and Joey Votto are also in the mix. In retroactively evaluating starting pitchers, I start with their actual runs allowed (crudely adjusted for bequeathed runners to produce what I call RRA). I consider peripherals, primarily what I call eRA (basically a component RA) and dRA (a DIPS RA). However, I do not start with either of those, and if there is a substantial difference in RRA, I usually don’t override it lightly. I’m not sure that this stance makes much of a difference in this year’s Cy Young vote, at least at the top of the ballot--the top guys fare well however you slice it, but it does put me at odds with anyone following what could be called the Fangraphs school of pitcher evaluation. I don’t think that, looking at these categories, you can come to any sort of clear conclusion about who was the better pitcher. The first guy pitched sixteen more innings, but he allowed .15 more runs per game, so when you compare them to a baseline, they are just about even. The first pitcher had a better eRA, which is a positive, but the second pitcher didn’t grossly outpitch his peripherals. All things outside of this chart being equal, I’d give the edge to the first pitcher, but I would hardly consider it a landslide. As you probably know, the first pitcher is Justin Verlander; the second pitcher is Jered Weaver. Weaver also trailed Verlander in dRA (3.44 to 3.75), which I purposely omitted in order to make a point, and obviously Verlander has the win-loss angle going for him in the mainstream. I have no qualms about putting Verlander first on my ballot, but Weaver ensured that he didn’t run away from the rest of the AL field. James Shields has a fairly large lead for the third spot on the RAR list at 77, with Sababthia fourth at 66 and three pitchers tightly clustered just below (Romero 62, Haren 62, Beckett 61). Shields and Romero both benefitted from low BABIPs (.259 and .247). Shields’ Rays teammates did lead the majors in DER by a wide margin; it wasn’t just him who was getting great defensive support. Still, as discussed above, given Shields’ sizeable RAR lead over the others, I’m more comfortable giving him the nod. It is enough to drop Romero out of the running for the last spot on the ballot, which comes down to Haren and Beckett. It would be tough to get much closer than that, wouldn’t it? While it appears that Clayton Kershaw will win the award and that Roy Halladay is the consensus #2, the top line on that table is Kershaw and the second line is Cliff Lee. Lee’s season is nearly indistinguishable from Kershaw’s in the categories that drive my decision. Halladay’s same categories line: 234, 2.48, 2.70, 2.71, 43, 73. This race is close enough that I decided to take a look at each pitcher’s performance on a game-by-game basis, using the relatively crude gW% I discussed in this post. However, looking at each game on its own does little more than verify that these pitchers were all very close: Lee leads the way at .685, but Halladay at .680 and Kershaw at .679 are right behind. We could consider strength of schedule. On the team level, and considering just the opponent’s overall quality rather than isolating opposing offense as would be more useful for comparing pitchers, my crude team rankings indicate that PHI and LA played nearly the same caliber of opposition--PHI has a 95 SOS and LA a 94. Baseball Prospectus’ data on quality of opposing hitter reveals that Halladay’s average opponent hit .260/.330/.413, Kershaw’s .263/.327/.416, and Lee’s .266/.332/.423. Respectively, those lines translate to approximate runs/game of 4.69, 4.67, and 4.83. But over 233 innings, even the difference between the high (Lee, 4.83) and the low (Kershaw, 4.67) is just 4 runs, and those figures probably shouldn’t be applied without any sort of regression. From the game-by-game analysis, I can also compute the pitcher’s personal park factor weighted by innings pitched in each park rather than assuming that each pitcher logged a 50/50 home/road innings split. My standard park factor for PHI is 101 versus 97 for LA. Halladay and Lee’s personal park factors are both 101, while Kershaw’s is 96, making any sort of deviation from just using the team PFs an exercise in futility. I put next to zero stock in win-loss record, but Kershaw’s is 21-5 mark is obviously more impressive than Halladay’s 19-6 and Lee’s 17-8 when compared to their team’s winning percentage. The pitcher’s run support (from ESPN.com) were 5.89, 5.52, and 4.95 respectively, which helps explain why Lee’s record lags behind the other two, but does next to nothing to help us sort out how effective they all were. In the end, I give the nod to Halladay--he led the three pitchers in all three run averages, and he does have a 5 RAR lead. That doesn't prove he was better, but I have no reason to override it. I think that a reasonable person could easily conclude that Kershaw or Lee deserved the award as well. I will admit up front that I have not paid much attention this year to the award debates, either in the mainstream or the sabersphere. This is good in the sense that I am coming into this cold, without having read many other perspectives that might bias me one way or another. It’s also bad for the same reason--while I don’t think I’ve ever found mainstream commentary on player value particularly useful, there are a lot of others out there worth reading. I simply decided this year that I wasn’t going to waste any time thinking about awards until the season was over. Not that I ever obsessed over them previously, but I pretty much completely shut them out of my mind this year. So much so that when an acquaintance who knows I’m a baseball nut asked me who I thought should be the NL Cy Young winner a couple weeks ago, he was shocked when the best I could offer was “uh, probably either Halladay or Kershaw”. In any event, let me start in the AL. This rookie crop belongs to the pitchers. My top three candidates are all starting pitchers. Michael Pineda got out the best start, Ivan Nova had the flashiest win-loss record, but Jeremy Hellickson was the AL’s most valuable rookie pitcher. Hellickson led the trio in innings (189 to Pineda’s 171 and Nova’s 165) and RRA (3.24 to 3.81 and 4.10). Combining the two, I have Hellickson at 52 RAR, Pineda 36, and Nova 30. Hellickson’s BABIP was just .229, so from a strict DIPS perspective one could make a case for Pineda (or even Nova) ahead of Hellickson. But for a retrospective award, I stick to actual runs allowed and first-order component RA for the most part. If Pineda and Hellickson were close, I would consider moving the former ahead, but the gap is too big in this case. For the remaining two spots on the ballot, the top position players are Dustin Ackley, Eric Hosmer, and Jemile Weeks. Ackley was the most productive hitter of the three, while Hosmer had 130 more PA than either of them. I have Ackley and Weeks both at 23 RAR with Hosmer at 21. Fielding and baserunning would seem to favor Weeks. You’ll note that I consider Mark Trumbo an afterthought. Yes, he hit 29 homers, but he also drew just 25 walks. His .290 OBA was second-lowest among AL first baseman with 300 PA, so despite the power, he ranks in the middle of the pack offensively at his position. He wouldn’t crack my top ten. If Trumbo is the biggest source of divergence from my take on the award and the mainstream, his NL counterpart will certainly be Craig Kimbrel. Kimbrel was terrific by any measure, but in the end you have 77 innings pitched. I don’t believe in extreme leverage bonuses--or much of a leverage bonus at all. I’ll give him an arbitrary 25% boost to get to 25 RAR, but no more. Among position players, the three standouts are Kimbrel’s teammate Freddie Freeman and Washington teammates Wilson Ramos and Danny Espinosa. I have them all essentially even in terms of RAR at 27. BP’s FRAA likes Espinosa’s fielding and baserunning, and that’s enough to put him in the lead. I suspect Freeman will get more support than Ramos, but the two aren’t that far apart as hitters, with Freeman creating 5.3 runs per game and Ramos 5.0. Freeman had nearly 200 more PA, but Ramos is a catcher. Freeman’s fielding reputation is good, but his FRAA was -5. It can go either way, but I prefer Ramos. Josh Collmenter and Vance Worley were the top starters, with apologies to Cory Luebke, who I could certainly make a ballot case for, but will refrain lest I be accused of favoritism. Collmenter worked 23 more innings than Worley, which puts him 5 RAR ahead (36 to 31). Collmenter did have a BABIP of just .263 to Worley’s .293, but the dRA difference is not large enough (4.06 to 3.72) to convince me to put Worley ahead. It has been a part of my life for almost as long as I can remember and it will remain so for as long as I live. For seven months of the year, it is as familiar a part of my life as brushing my teeth or eating dinner, and so it is easy to take for granted. But then one day I wake up and suddenly it is gone, and in the void there is malaise. When the weather is nice, it is played; when it is dark and cold, it moves towards the tropics and away from focus. While it can be used to tell seasons, it scoffs at time while it is played. The competitors dictate the endpoint through their play. It is a team game, but in many ways it allows the individual to stand and be judged on his own merits. It is a game that, through its variants and offshoots, is quite playable by a large number of people. It is the great American pastime, but it is also the great Cuban passion, the great Dominican pastime, perhaps the most popular import Japan has ever known. We call it baseball, but it is equally beisbol, yakyu, honkbal, pelota. It is a game simple enough that it can be described (and recorded, on nothing more complex than a piece of paper) discretely--by inning, by score, by out, by baserunner, by count--yet complex enough that there are hundreds and hundreds of people like me who are fascinated by it and spend much of our free time thinking about it, yet we still discover new things about it. And if you are wired to view the world in a certain way, to try to find and verify patterns, to quantify when possible, and sometimes to find meaning and order through randomness and chance--then sabermetrics is a vessel for enjoying it, understanding it, and celebrating it. To know that what we have seen over the last month is not just unlikely--but rather to have a systematic way of thinking that allows us to estimate just how unlikely--does not detract from it. Once in a while we are presented with just one more game--one game that is, without question, the end. It almost goes against the spirit of the game to be pettily constrained by a set limit of games that cannot be cheated, unlike the nine innings that often become ten, and sometimes become twelve, and on glorious occasions become twenty, and in theory can be infinite. The potential is often greater than the payoff--but either way, the journey was incredible. * There have been eighteen postseasons in which the Division Series has been held (I’m counting the 1981 playoffs between the half-season winners as Division Series). 2011 set the new record for the most aggregate games played in the round, with nineteen. The maximum is twenty, and had the Rays managed to take an additional game from the Rangers it would have been reached. The previous high was eighteen, which occurred in 1981, 2001 and 2003. The record for most total games played in the postseason (since 1995; in this case I’m excluding 1981 because the LCS was only a five-game series at that point) is 38 in 2003--two LDS went four and the World Series went six, but all other series went the distance. The ALCS and NLCS are both well-remembered (I can just say Grady Little or Aaron Boone and Steve Bartman and you’ll remember the circumstances). No other postseason has come particularly close; the runner-up is 2001, which saw 35 total games played despite each LCS only lasting five games. The fewest games played in a post-season is 28 in 2007--every series was a sweep except for the two involving Cleveland, who beat New York in four in the ALDS then lost to Boston in seven in the ALCS. To put 2007 in perspective, every series from here on out in 2011 could be a sweep, and the total games played would be 31. A natural follow-up question is “What is the expected number of postseason games?” If you assume that each game is a 50/50 proposition (equally matched teams, no home field advantage, no variation in team quality from day-to-day, etc. ), then it’s very straightforward to estimate series length with the geometric distribution. For a five-game series under those assumptions, there is a 25% chance for a sweep and a 37.5% chance for a four or five game series. For a seven-game series, there is a 12.5% chance for four games, 25% for five games, and 31.25% for six or seven games. Thus, the expected length of a five-game series is 4.125 games, the expected length of a seven-game series is 5.8125 games, and the expected number of games in the postseason is 33.9375. 1997, 2002 and 2004 all met expectations with 34 games. There is a slight tendency for series to be resolved more quickly than one would expect, but it isn’t particularly significant, and the average of 5.75 is not far off the expected 5.81. *What I’m going to say here is not in any way novel; many fans, both sabermetrically-inclined and not have expressed the same opinion over the years. But there were two instances that I considered so egregious in the Arizona/Milwaukee game give that I can’t help but comment on it here. I have always thought that many managers are way too eager to make substitutions that sacrifice offense for baserunning or defense or the pitcher’s slot in the lineup, but I’m not sure I’ve ever seen a better display of it than in the aforementioned Game Five. In the eighth inning, Arizona trailed 2-1 with runners at first and third and two out. Chris Young drew a walk to load the bases and advance Miguel Montero from first to second, bringing Ryan Roberts up with the bases loaded. At this point, Kirk Gibson decided to pinch-run for Montero, sending Collin Cowgill in. Montero occupied the #4 spot in the order, while Roberts was #7. Thus, it doesn’t take a rocket scientist to realize that, with an additional inning to go, there was a pretty good chance that Montero’s vacated spot would come up to bat again, and barring Arizona scoring at least two runs and holding Milwaukee in the bottom of the eighth, it would come with the Diamondbacks still needing a run (when I say needing a run, I mean it in the sense that Gibson apparently considered, since I would never say you don’t “need” more runs at any point in the game). One would have to evaluate the marginal value of Cowgill’s baserunning very highly to see that as a winning move, especially considering that Montero would be off with contact given that their were two outs. Of course, as it played out, Roberts grounded into a fielder’s choice, and Montero’s spot did come up in the ninth, with the game now tied but runners at the corners and two outs. Henry Blanco hit into a fielder’s choice, and Arizona did not mount a threat in the tenth before allowing the game-winning run in the bottom of the frame. The second move was not nearly as egregious, but it was still quite puzzling to me. With a 2-1 lead in the top of the ninth, Ron Roenicke summoned his closer, John Axford. The pitcher’s spot was due up fourth in the bottom of the ninth, so he double-switched Axford into Rickie Weeks’ #5 spot since he’d made the last out of the eighth. Given that Roenicke wanted to make a double switch, Weeks was the only obvious candidate to be replaced--removing Braun or Fielder would be worse, especially since they were closer to coming to the plate, and Nyjer Morgan’s second spot was due up sixth in the bottom of the ninth. (One could make a case that Morgan would be the best candidate, but given that he got the walkoff hit in the tenth it wouldn’t be an argument that would fly over well with the “results not process” crowd). What I find interesting about the double-switch for the home team taking the lead into the top of the ninth is that the only way the batting order matters at all is if Axford surrenders the lead. Thus, while you preserve Axford’s ability to pitch the tenth without sabotaging your offense in the ninth, you also know that if he does so, it will be only after he yielded a run in the ninth. You know that you will “need” runs if the #5 spot ever comes to the plate again. Of course, this all worked out for Roenicke, since Axford pitched a 1-2-3 tenth, Morgan got the game-winning hit, and the #5 spot never batted again. And Roenicke does apparently like to bring Counsell in as a defensive replacement for Weeks, so if Weeks is going to come out of the game anyway, the double switch is the way to do it. The data comes from a number of different sources. Most of the basic data comes from Doug's Stats, which is a very handy site. KJOK's park database provided some of the data used in the park factors, but for recent seasons park data comes from anywhere that has it--Doug's Stats, or Baseball-Reference, or ESPN.com, or MLB.com. Data on pitcher's batted ball types allowed, doubles/triples allowed, and inherited/bequeathed runners comes from Baseball Prospectus. In the calculation of the PFs, I did not get picky and take out “home” games that were actually at neutral sites, like the Astros/Cubs series that was moved to Milwaukee in 2008. Team defense: Innings Pitched, BA, OBA, SLG, Innings per Start (IP/S), Starter's eRA (seRA), Reliever's eRA (reRA), RA/G at home (hRA/G), RA/G on the road (rRA/G), Battery Mishap Rate (BMR), Modified Fielding Average (mFA), and Defensive Efficiency Record (DER). BA, OBA, and SLG are park-adjusted by dividing by the square root of PF; seRA and reRA are divided by PF. For all of the player reports, ages are based on simply subtracting their year of birth from 2011. I realize that this is not compatible with how ages are usually listed and so “Age 27” doesn’t necessarily correspond to age 27 as I list it, but it makes everything a heckuva lot easier, and I am more interested in comparing the ages of the players to their contemporaries, for which case it makes very little difference. The "R" category records rookie status with a "R" for rookies and a blank for everyone else; I've trusted Baseball Prospectus on this. Also, all players are counted as being on the team with whom they played/pitched (IP or PA as appropriate) the most. For relievers, the categories listed are: Games, Innings Pitched, Run Average (RA), Relief Run Average (RRA), Earned Run Average (ERA), Estimated Run Average (eRA), DIPS Run Average (dRA), Batted Ball Run Average (cRA), SIERA-style Run Average (sRA), Guess-Future (G-F), Inherited Runners per Game (IR/G), Batting Average on Balls in Play (%H), Runs Above Average (RAA), and Runs Above Replacement (RAR). 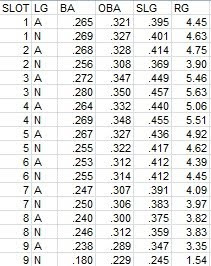 * cRA is based on batted ball type (FB, GB, POP, LD) allowed, using the actual estimated linear weight value for each batted ball type. It is not park-adjusted. * sRA is a SIERA-style RA, based on batted balls but broken down into just groundballs and non-groundballs. It is not park-adjusted either. Both cRA and sRA are running a little high when compared to actual RA for 2010. Both measures are very sensitive and need to be recalibrated in order to overcome batted ball-type definition differences, frequencies of hit types on each kind of batted ball, and other factors, so keep in mind that they may not perfectly track RA without those adjustments (which I have not made in this case). I’ll let you make your own determination as to whether you find this data useful at all. Personally, I prefer to look at RRA, eRA, and dRA. %H is BABIP, more or less; I use an estimate of PA (IP*x + H + W, where x is the league average of (AB - H)/IP). %H = (H - HR)/(IP*x + H - HR - K). Pitches/Start includes all appearances, so I've counted relief appearances as one-half of a start (P/S = Pitches/(.5*G + .5*GS). QS% is just QS/(G - GS); I don't think it's particularly useful, but Doug's Stats include QS so I include it. All players with 285 or more plate appearances are included in the Hitters spreadsheets. (I usually use 300 as a cutoff, but this year when I had the list sorted there were a number of players just below 300 that I was interested in, so I chose an arbitrarily lower threshold). Each is assigned one position, the one at which they appeared in the most games. The statistics presented are: Games played (G), Plate Appearances (PA), Outs (O), Batting Average (BA), On Base Average (OBA), Slugging Average (SLG), Secondary Average (SEC), Runs Created (RC), Runs Created per Game (RG), Speed Score (SS), Hitting Runs Above Average (HRAA), Runs Above Average (RAA), Hitting Runs Above Replacement (HRAR), and Runs Above Replacement (RAR). That being said, using “replacement hitter at position” does not cause too many distortions. It is not theoretically correct, but it is practically powerful. For one thing, most players, even those at key defensive positions, are chosen first and foremost for their offense. Empirical work by Keith Woolner has shown that the replacement level hitting performance is about the same for every position, relative to the positional average. Player spreadsheets should be coming by the middle of the week.